Every once in awhile, we run into a situation with SharePoint 2010’s Managed Metadata where the feature is not enabled and not available. In our experience, this has been the result of creating the top level site in the site collection using the Blank Site template. Now, go enjoy your meta data! 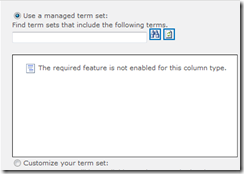 This entry was posted in SharePoint on April 10, 2012 by ArmgaSys. Same issue here, thanks for pointing this out! Same problem here too, and your fix solved it. Thanks!! Ran into this with a 2010 site collection using Blank Site template in SharePoint 2013, too. Thanks for the post! The only option we can think of is to call the office365 support line.